The history of the Zhostovo craft goes back to the very beginning of the 19th century when first craftsmen’s workshops for decorative painting of lacquered items made of papier-mache were founded in the villages of Zhostovo, Ostashkovo, Khlebnikovo and Troitskoe .The Vishnyakov brothers stood at the origins of the traditional Zhostovo tray. Floral compositions are a signature pattern of the Zhostovo art which combines realistic images of flowers and berries with artistic generalization in traditional Russian decorative brush painted ornaments on chests, birch bark boxes, spinning wheels and other household objects. There are historic patters of floral compositions made of a variety of field and garden flowers such as “flower bouquet”, “scattered flowers”, “flower garland” and “wreath”. With a big brush a master outlines the major elements of the future composition which should be well balanced both in terms of the colour palette and in terms of mutual arrangement of flower blossoms, buds, leaves and stems. 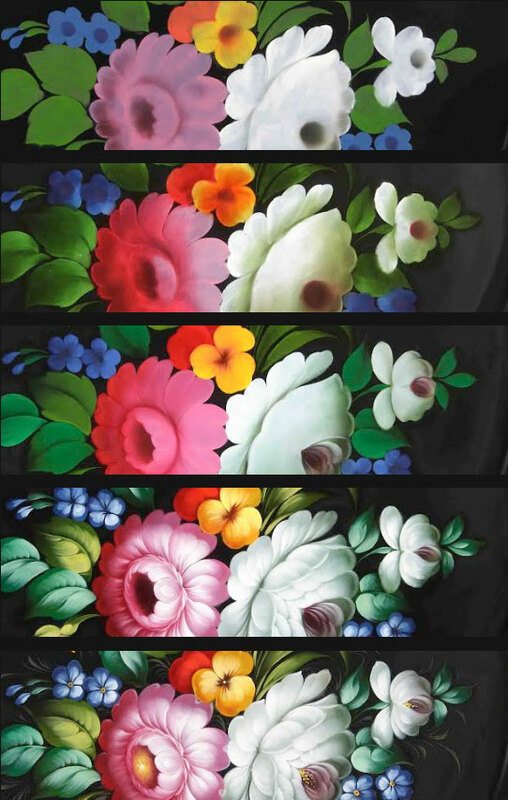 The Zhostovo floral compositions are traditionally painted with vibrant colours against a black background. However, the background may also be red, blue or green. The edges of trays are decorated with lacy floral ornaments. A Zhostovo tray with luxurious and tactile flower bouquets is inspired by the creativity of the best folk artists who carefully preserve the traditions of the art absorbed from their predecessors to pass the secrets of the craft to the next generations of Zhostovo masters. Each metal tray forged at our factory has a unique ID number. The quality is confirmed by the certificate. The painted metal trays are shipped in hand-made gift boxed and bags. We will be glad to welcome you in our the fascinating world of traditional Zhostovo floral patterns where you can enjoy the infinite beauty of colours and flower blossoms. 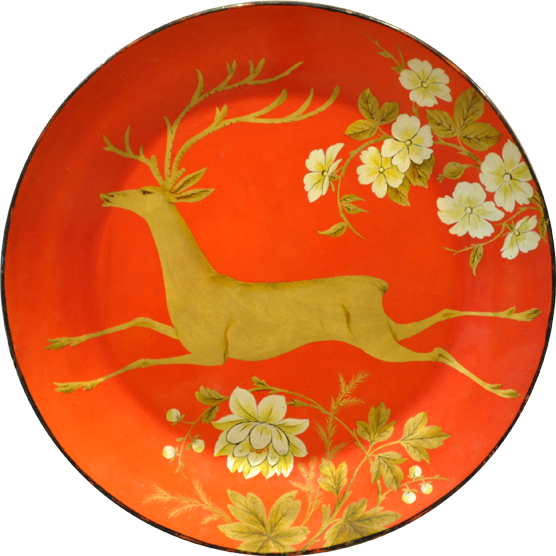 Zhostovo trays are traditionally hand-forged (cold-hammered from metal sheets). 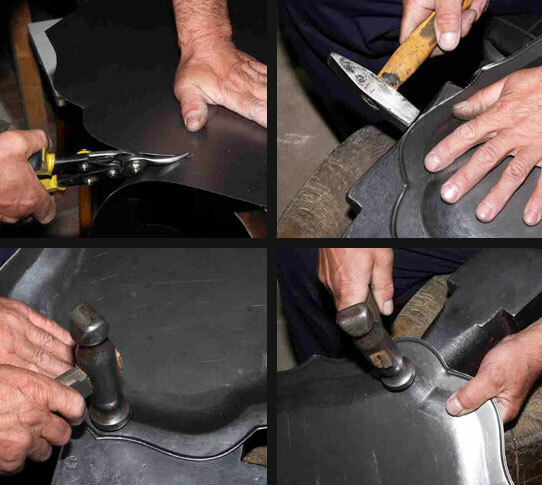 A farrier cuts a future tray from a metal sheet with slitting shears, then uses hammers to produce a desired shape and make the surface smooth. The edges of the tray are rolled on a special machine. During the 200 years the craftsmen created over 150 typical shapes of Zhostovo trays from miniature to exceptionally big ones. Each shape has well-balanced proportions. The trays can be deeper or shallower, wider or narrower. Prevailing shapes in any given period of time are influenced by current tastes of the consumers. Today some tray shapes are made by machines: a workpiece of a necessary size is cut out from a metal sheet and then passed to a press machine to produce a required form– oval, round, rectangular, octagonal or even guitar-shaped. 32 shapes are made by machines while all other shapes are still manufactured by the old artisan method. The forged metal piece is then thoroughly degreased, filled with a special putty and polished to produce a very smooth surface. The next step is coating with primer and two layers of black varnish. In between the layers the workpiece is dried and polished. The art of lacquered decorative painting on black varnished surfaces came to Russia from Japan and China over 400 years ago. Russian craftsmen adapted the foreign complicated technology to the materials which they had on hand and thus began the history of new folk art and production of high quality household objects and decorative accessories. While the tray shapes may be different – round, oval or other and the compositions vary (flower bouquets, scattered flowers, wreaths, etc. ), the masters always decorate them in a series of definite consecutive steps and use the techniques which remained unchanged throughout the years. The artists work with squirrel hair brushes cleaned in turpentine and paints diluted with linseed oil. The selection of brush sizes is very wide from the brushes which are as thin as a needle to very big ones. Each master works with his own instruments. 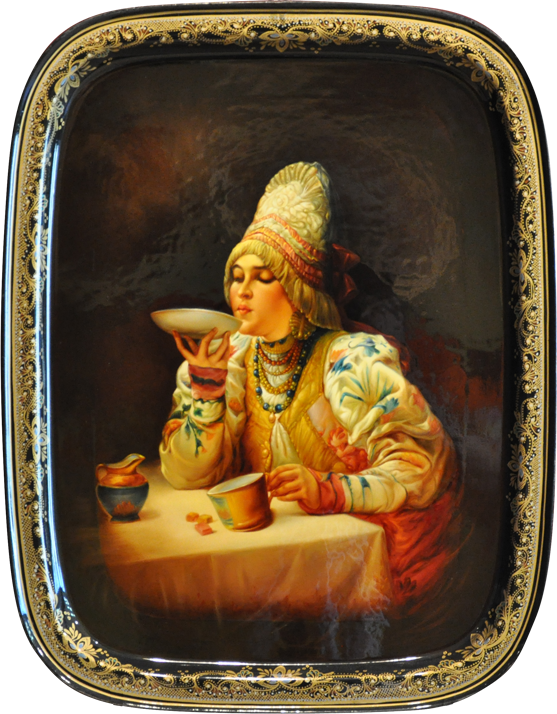 Zhostovo trays are decorated with a multi-layered painting technique. The first layer (also called “zamalevka”) is done closer to the end of a working day to allow for drying time. Zamalevka means sketching the future composition of flowers, leaves and buds with whitened paint. All elements of the composition must be mutually complement and look seamlessly on the given tray shape. When dry, the master applies a layer of transparent oil colours to glaze the dark areas of the flowers and leaves (this is the second step called “tenezhka”). At the third step (“prokladka”) the painter uses thick paint to highlight certain areas and define the shapes of leaves and flowers. The next step – “blikovka”(adding glare) is performed by each artist in his own manner and rhythm with soft and generous strokes or with frequent small touches. “Chertezhka” is the step which includes detail work in the flower centres, linework through and around leaves, buds, seeds and tendrils. It's followed by painting pistils and stamens in flowers, which are called “sementsa”. And finally “privyazka” – filling in the blank spots between major elements of the composition to give it a finished look. Some masters add minimum simple binding elements, others choose to paint a lot of sophisticated eye-catching details. After this the tray is dried and handed over to an ornamental painter who will decorate the borders. Both painters and farriers are continuously searching for innovative forms and compositions which will at the same time preserve the Zhostovo traditions. The creativity, initiative and ambitions of the masters ensure progress and drive the craft forward to new modern-day interpretations of the folk art where there is no place for kitsch or bad taste.